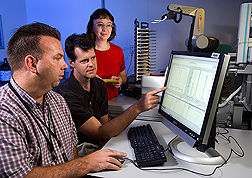 U.S. Army Medical Research Institute of Infectious Diseases microbiologist Chris Whitehouse (left) and ARS plant pathologists William Schneider (center) and Elena Postnikova use the novel robotic diagnostic technology known as TIGER to diagnose plant diseases. There are lots of ways to identify pathogens—bacteria, fungi, and other microorganisms that cause disease. One of the oldest methods is to peer through a microscope. Another reveals a pathogen’s identity based on whether it will grow on a specific nutrient in a laboratory culture. A third, more high-tech approach uses PCR (polymerase chain reaction) to procure a pathogen’s telltale genetic fingerprint. All have their strengths and weakness. But a diagnostic method has yet to emerge with the speed, accuracy, sensitivity, and ease of use that practitioners of the art would like. Now, however, a new tool that comes close to meeting these criteria is within reach of a team of ARS scientists tasked with helping safeguard America’s crops and indigenous plants from diseases caused by exotic pathogens—those that originate from outside the United States—like citrus greening, citrus canker, and soybean rust. The new tool is called “Triangulation Identification for Genetic Evaluation of Risks,” or TIGER. Developed by Ibis Biosciences of Carlsbad, California, in collaboration with Science Applications International Corporation, of San Diego, TIGER can be used to identify virtually every microbe in a given sample—of soil, water, air, blood, plant, or otherwise. Furthermore, TIGER can identify microbes in minutes. Other methods, including some PCR-based ones, take hours, days, or even weeks, and they typically detect only a few, to a few dozen, pathogens at a time. “This is really frontline stuff,” William L. Schneider, a plant pathologist in ARS’s Foreign Disease-Weed Science Research Unit at Fort Detrick, Maryland, says of TIGER. So frontline, in fact, that Schneider’s neighbors at the U.S. Army Medical Research Institute of Infectious Diseases (USAMRIID) have been among the first to use TIGER as part of the military lab’s efforts to detect, diagnose, and counter human pathogens—whether encountered by troops deployed abroad or released domestically as bioterrorist attack agents. Now, as part of a pilot project begun in the summer of 2005 with USAMRIID’s Diagnostic Systems Division, Schneider and others at the ARS lab are collaborating with Army scientists to both test and build up TIGER’s capacity to identify crop pathogens. The project also dovetails with Department of Homeland Security plans to establish a National Biodefense Analysis and Countermeasures Center at Fort Detrick. There, experts from various federal agencies, including ARS, will conduct biological threat assessments, bioforensic investigations, and other studies. With such threats extending to so-called agro-terrorism, “It makes perfect sense to apply the same technologies being developed for protection of human lives to protection of agriculture and livestock,” says Schneider. He and postdoctoral associate Elena Postnikova are collaborating on the TIGER pilot project with Chris A. Whitehouse of USAMRIID’s Diagnostic Systems Division. The threat of agro-terrorism makes for attention-grabbing headlines. But Schneider’s project is just as concerned about potential introduction of crop pathogens by more mundane routes. They could be carried by agricultural imports from abroad, by globe-trotting tourists, or even by storm systems like Hurricane Ivan, on which soybean rust is thought to have flown into the United States from South America in September 2004. Detection is a critical first step in containing such pathogens and minimizing harm caused by those already established. Schneider says TIGER has the speed, sensitivity, and accuracy to be a powerful new tool in both regards, but especially in distinguishing new, as-yet-undescribed pathogens from native-born crop threats. Like other PCR-based fingerprinting methods now used for early detection and routine monitoring of plant pathogens, TIGER makes use of specially designed fragments of nucleic acid called “primers.” Their job is to find, and bind to, complementary segments of DNA in a pathogen’s genome—if it’s indeed present in a sample. One drawback to today’s PCR methods is that the nucleic acids making up the targeted pathogen’s DNA must first have been sequenced. But TIGER’s primers are very general, and they seek to bind with genes or gene regions shared among all bacterial species. Because of this, TIGER’s primers serve as a one-size-fits-all tool that detects all bacteria in a given sample. Most importantly, it skips the need for prior genome sequencing. Schneider says other methods, including immunological assays, agar-growth tests, and Gram-staining, all have their place in science, but each has shortcomings that TIGER gets around. “Let’s say there’s an outbreak of an unknown disease in tomatoes in California,” he says. “Pathologists have to try to sort out what pathogen causes the disease. But you have to be able to separate the actual pathogen from all the other microorganisms that just happen to be there at the same time. That’s not easy. Schneider and Whitehouse are conducting research on 3 fronts, starting with 14 genera of plant disease bacteria. The first front calls for testing generalized primers for the bacteria; the second involves validating TIGER’s ability to differentiate among them, including their subspecies, races, and the like. On the third front, they’ll test TIGER’s effectiveness in identifying pathogens from a mixed slurry of plant cells, followed by testing of whole plants or select plant tissues. The database on which TIGER now relies mainly contains information on bacterial pathogens of humans. An eventual outcome of the ARS-Army collaboration will be the addition of plant-disease bacteria. Then the stage will be set for TIGER-based identifications of plant-pathogenic fungi and viruses, and efforts to control theses pathogens should be expedited.—By Jan Suszkiw, Agricultural Research Service Information Staff. William L. Schneider is in the USDA-ARS Foreign Disease-Weed Science Research Unit, 1301 Ditto Ave., Frederick, MD 21702-5023; phone (301) 619-7312, fax (301) 619-2880. "TIGER Technique Targets Plant Pathogens" was published in the November/December 2006 issue of Agricultural Research magazine.